My Guys Moving & Storage voted the Best Moving Company in Prince William County for the fifth year in a row! It’s an extra honor because because this is also InsideNoVa’s 5th Anniversary of their special section: The Best Of Prince William County. All the movers and staff at My Guys were happy to hear the news that the team was once again acknowledged for providing the best moving service in the northern Virginia area. Last year, My Guys was runner-up to another great moving company in Manassas, VA that made the list as well. Each of the moving companies offers full-service, professional moving and storage for both home and office. The 2018 Best of Prince William contest had over 70,000 votes cast in over 200 categories ranging from most colorful character to best local attractions, such as best winery and date spot, and even your favorite road. We’d like to give a shout-out to our friends at 123Junk for winning the category of junk removal. For a complete list of all the results, check out the edition of InsideNoVa Prince William on July 20th, 2018. Meanwhile, if you need award-winning moving services, call My Guys! You can get free moving tips whether you move with us or not, and if you do book your move with us, remember ask about our free used-box program. 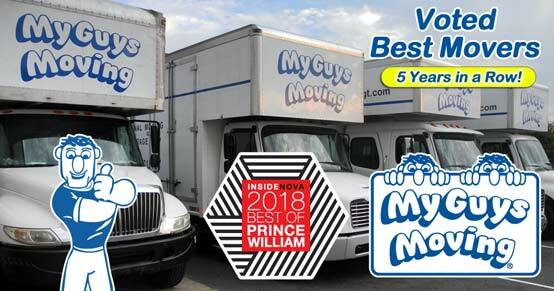 We know there are a lot of moving companies to choose from, so thanks to everyone who voted for My Guys Moving & Storage as the Best Movers in Prince William County!